Taddy & Co. produced three sets of cards in their Prominent Footballer series; 1907, 1908 and finally in 1913. The first series has already been featured and this particular card is the fourth from the second series that was issued during 1908. Once again the series included two different back designs, ‘Imperial Tobacco’ and ‘Grapnel Mixture’. Frank was born in Ware, Hertfordshire, on 8th November 1888 and began his playing career with Hitchin Town whilst working for a firm of solicitors. He signed for QPR in 1907 after turning professional and made his debut at Millwall on 29th February 1908. 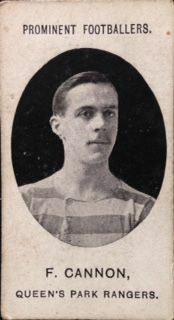 Frank went on to make 29 1st team appearances, scoring 10 goals, before moving on to West Ham United in 1909. After the outbreak of war, Frank joined the Bedfordshire Regiment. Later, he was transferred to the Essex Regiment and rose to the rank of Sgt Major. Aged just 27, Frank was killed by shrapnel at Ypres on 15th February 1916 and left behind his wife Violet, and three children. He was buried at Potijze Burial Ground in Belgium. Quarter Master Sgt J. P. Martin later described the circumstances of his death in a letter: ‘He was just ready to leave the trench when several shrapnel shells burst over him, wounding him and several others.